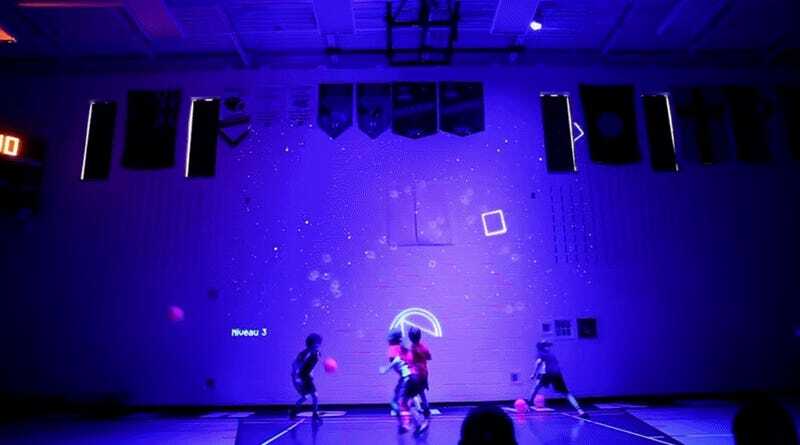 The Interactive Gym, the latest project from the Canadian tech company SAGA, takes the traditional idea of gym class and adds a layer of augmented reality, turning the walls into giant games of skee-ball. According to Routhier, the project is part of an effort to reinvent the way gymnasium could be used as a “playground for learning.” While the learning portion isn’t readily obvious from the videos, the playground bit appears to be a success. 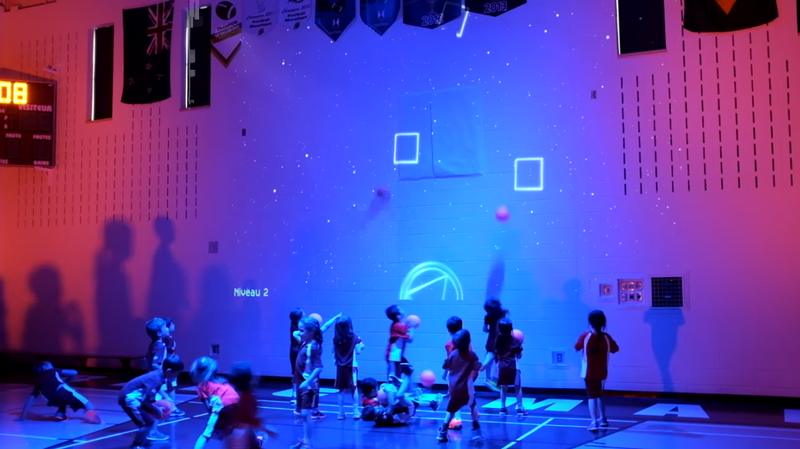 “We believe that introducing new types of interactivity and feedbacks could make physical activity more fun and accessible to all type of kids,” said Routhier. As SAGA continues to prototype the Interactive Gym, the next step will be to create more games and augment the space in different ways using the technology. Routhier and Simon St-Hilaire, the company’s lead developer put the first prototype together in just under a week for Externat St-Jean-Berchmans, an elementary school in Quebec City. Coordinating with the school and its director, they set up the equipment and led the kids through a handful of different games for an afternoon. “We want to connect humans in the physical world and most of our work is done through those beliefs,” Routhier said. It’s a philosophy of play that’s bears more than a passing resemblance to how Nintendo has approached its own gaming technology. Often derided for relying on gimmicks for each of its new consoles instead of simply emulating the more grown-up and austere focus on pure computing power shared by Sony and Microsoft, there’s always been a part of Nintendo that’s seemed hesitant to fully give up on its roots as a manufacturer of physical play things. Writing for The Atlantic, John Irwin described the upcoming Switch as an attempt by Nintendo to get players to look one another in the face again. Games like 1-2 Switch shift the focus away from what’s happening on screen to what’s going on with the other player. Irwin even cites a 2012 interview with The New York Times in which designer Shigeru Miyamoto said that the relationship between video games and screen was parasitic. “For many years I have said that traditional game systems are too reliant on the television,” he told the Times. In its own way, the Interactive Gym tries to cut against the same escapist character of many traditional video games and virtual reality experiences. There’s no putting on a headset that blocks out the rest of the world or staring at computer monitors. “We believe that augmenting the physical world is much more interesting than the isolation created by virtual reality or most technological approaches,” said Routhier. In the end, he feels these “tangible” interactions are more grounded than digital-only ones.